Be sure to check out the July/August issue of Port City Life (soon to be Maine magazine). Inside is a supplement called Maine Eats. 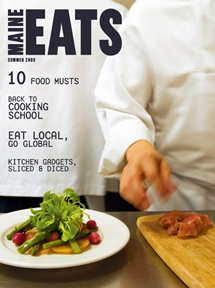 I photographed several food-related venues for this issue including the amazing restaurant Fuel in Lewiston (a photo of which adorns the cover at left), the splendid bistro anneke jans in Kittery, and bread and cheese making classes at Stone Turtle Baking School in Lyman and Wolfe’s Neck Farm in Freeport. These are the types of assignments I love—shooting food and people who are passionate about it. I can’t speak highly enough of the food, management and staff at both Fuel and anneke jans. Everyone was incredibly pleasant and accommodating, and I was blown away by the tasty treats coming out of the kitchen. Both restaurants use a lot of fresh, locally grown or harvested food and prepare it in innovative, yet relatively simple ways that allow the true flavors of the food to come through. Living in the Portland area, I am spoiled by the wealth of great restaurants five miles from my home, but it was a treat to witness and sample what’s happening in other parts of the state. I highly recommend special trips to both of these fine restaurants. The classes at Wolfe’s Neck Farm and Stone Turtle Baking School were equally enlightening and enjoyable. I wrote an earlier post about the bread, butter and cheese making class at the farm with a photo that didn’t fit into the magazine layout. Of course, there’s never enough room with these articles to fit all my favorite photos from the assignment, so I’m including some more here. Enjoy! 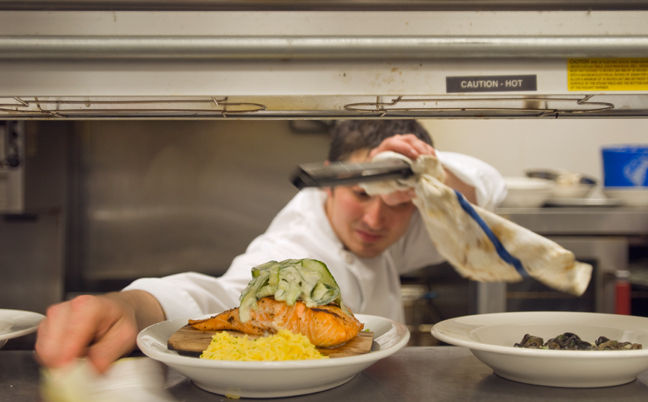 Justin Oliver, the hardworking chef at Fuel, with salmon on a cedar plank, shaved cucumbers and saffron rice. 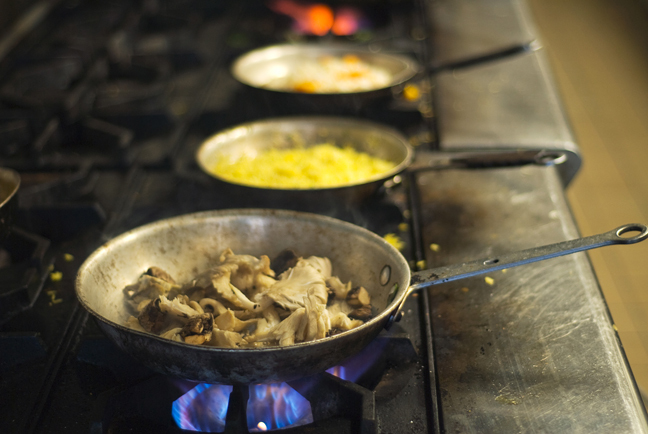 Mushrooms, saffron rice and squash risotto over the flame at Fuel. 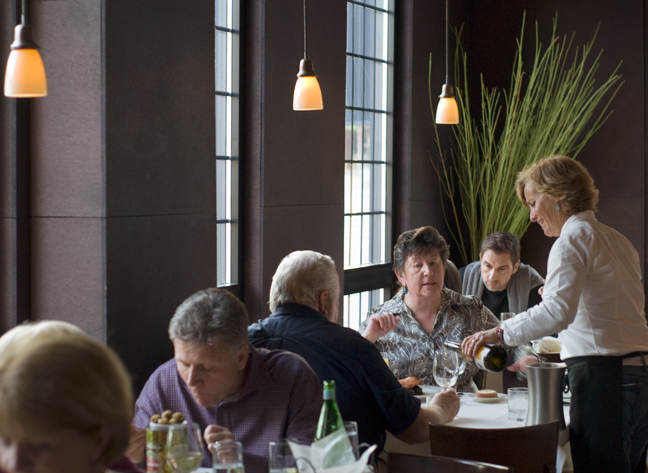 The dining room at anneke jans is intimate and homey, and almost always bustling! 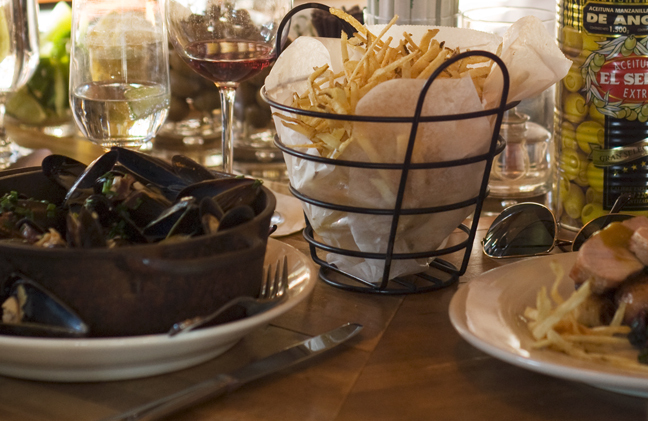 Large baskets of pomme frites are a favorite at anneke jans. This entry was posted in food, Port City Life and tagged anneke jans, food photography, Fuel restaurant, maine food, Stone Turtle Baking School, Wolfe's Neck Farm on June 25, 2009 by Stacey Cramp.